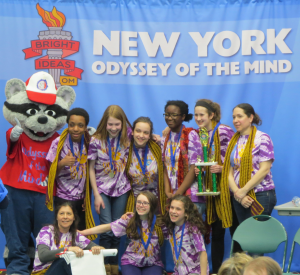 The Warwick Valley Middle School Odyssey of the Mind team is going to WORLD COMPETITION! 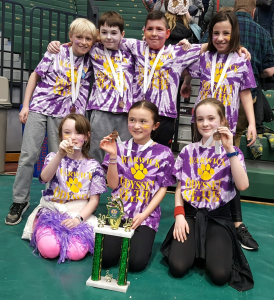 The team won first place in its division at the New York State Odyssey of the Mind competition on March 23 and will now compete against teams from all over the world at Michigan State University at the end of May! They are coached by Rekha Woods and Donna Denny. Between attempts, the vehicle was disassembled, put back into the suitcases, and taken to a different area where it was reassembled and driven again. Finally, the OMER-mobile was thrown a hero’s parade as a show of appreciation. All Warwick teams had great results! Warwick’s two other teams also fared well in the competition. Park Avenue Elementary School earned third place for its Division I presentation of “Hide in Plain Sight.” Team members are Cavan Byrne, Nina Cirillo, AJ Kobrick Violet Collins, Mason Scarano, Denis McAteer and Madison Lijoi. Their coaches are Kerin and Justin Lijoi. 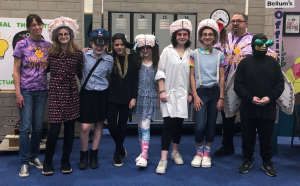 A second team representing Warwick Valley Middle School earned fourth-place for its Division II presentation of “Hide in Plain Sight.” Team members are Mary Hoey, Stephen D’Ambrosio, Lily Burrows, Talia Hartigan, Sophia Amato, Sophia Samborski and Alana Adee. They are coached by JB DiCarlantonio and Michelle Amato. Both teams took a cue from nature in this problem where they created and built a team-made mechanical creature that hides in plain sight. The creature changed its appearance three times to avoid being detected by a “searcher character” trying to find it. The way the creature changed was different each time. The teams created and presented a performance where its creature got into – or out of – various situations using this resourceful skill. In the end, the creature surprised everyone by changing its appearance a final time and revealing its true self. OM is an international educational program that provides creative problem-solving opportunities for students from kindergarten through college. Team members apply their creativity to solve problems that range from building mechanical devices to presenting their own interpretation of literary classics. Team members work together at length to solve a predefined long-term problem and present their solution to the problem at a competition. They must also participate in the spontaneous portion of the competition by generating solutions to a problem they have not seen before. While the long-term problem solution often takes many months to complete and involves various elements of theatrical performance, construction and design, the spontaneous portion occurs the day of the competition. They bring their solutions to competition on the local, state, and world level. Thousands of teams from throughout the U.S. and from about 25 other countries participate in the program.